Visit the Hollywood Walk of Fame and find your favorite Hollywood Walk of Fame Star. 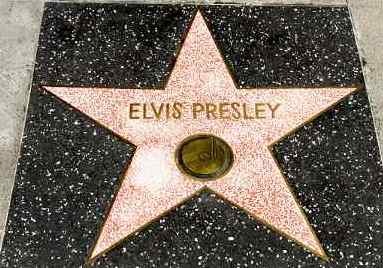 Elvis Presley, Michael Jackson, The Beatles, Tom Hanks, Harrison Ford, Marilyn Monroe - they are all here, along with over 2400 of your favorite Hollywood stars. The Hollywood Walk of Fame stars include actors, musicians, directors, producers, music groups, theater groups, fictional characters and more who have made significant accomplishments to the entertainment industry. It is located in - you guessed it - Hollywood California , about 125 miles north of San Diego, in Los Angeles. The Hollywood Walk of Fame has over 2400 stars embedded in the sidewalk along 15 blocks of Hollywood Boulevard and 3 blocks of Vine Street in Hollywood, California. This popular Hollywood attraction receives over 10 million visitors a year. Each star is a coral pink terrazzo five-point star rimmed with brass, inlaid into a charcoal colored terrazzo background. They are spaced at 6 foot intervals (1.8 meters). Address: Hollywood Boulevard from Gower Street to La Brea Avenue, and on Vine Street from Yucca Street to Sunset Boulevard, in Los Angeles, California. Walk of Fame Directions: Interstate 5 in Los Angeles, take the Hollywood Freeway (US 101), exit Highland Avenue and go south. You can park at the Hollywood Blvd. and Highland Avenue parking lot. The parking entrance is on the right about half a mile down the hill. There is also parking at the other end of the Walk of Fame, near Hollywood and Vine, at the Hollywood Metro station. 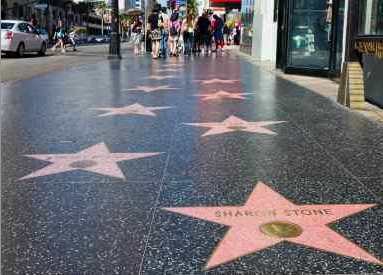 You can search for your favorite stars and find their location on the Hollywood Walk of Fame. There are several stars with the same name, such as Michael Jackson, so if you have a favorite star, be sure to search before you go to get their exact address. Here are the location of the Hollywood Walk Stars for these famous people. An even number address is on the south side of Hollywood Blvd, and odd number address is on the north side of Hollywood Blvd. The Beatles 7080 Hollywood Blvd. Tom Hanks 7000 Hollywood Blvd. Michael Jackson 6927 Hollywood Blvd. Harrison Ford 6801 Hollywood Blvd. Bruce Willis 6915 Hollywood Blvd. Ellen DeGeneres 6270 Hollywood Blvd.